I didn’t grow up using this ability. I learned how to communicate intuitively with animals by taking classes and reading books, and you can do this too. Before going into this field I worked as a scientist. I have a BS in Resource Conservation from the University of California at Berkeley, and a MS in Biology and Systematic Ecology from San Francisco State University. Once I discovered that animal communication was actually possible, I became fascinated and dedicated myself to learning it. I now work full-time as an animal communicator, offering consultations for animals worldwide to help solve behavior problems, find lost animals, assist animals during crisis and death, and reconnect people with animals and the natural world. 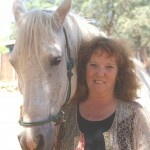 I work with all animals and am a proponent of natural training methods and holistic health care. Teaching people to communicate intuitively brings about a fundamental change in consciousness toward animals and nature. People learn first-hand that other species are as intelligent, emotionally complex and spiritually evolved as humans. Once they realize this they immediately see the need to treat other species with more consideration. This is exactly the kind of consciousness change that must occur if we hope to restore balance and health to the earth’s ecosystems.